Unwittingly stumbling upon a new place is what makes travel so exciting, But of course, it never hurts to understand a little about the area before you jet off. We'll get you up to speed on the essentials about Palm Beach Shores. Palm Beach Shores is a neighborhood in Palm Beach - West Palm Beach. You'll find it 4 miles (6 kilometers) to the north of the center. Securing a package deal via Travelocity is the easiest way to save heaps on your vacation to Palm Beach Shores. And also, you can select from no less than 400 airlines and 665,000 accommodations. From accommodations and airfares to car rentals and experiences, you've got the added security of 24/7 personal assistance with our Customer 1st Guarantee. Have you noticed an even better bargain elsewhere? We'll match the price and reimburse the difference^. You're able to cancel your package bookings with no extra fees from us. You know what that means? Less stress, more fun! And so long as you get in quick, most accommodations don't charge fees either^. Who doesn't enjoy being in the thick of the action? Take a look at our 7 accommodations within walking distance of central Palm Beach Shores and start planning your must-see list for this enticing neighborhood. Check out the Palm Beach Marriott Singer Island Beach Resort & Spa (3800 N Ocean Dr) and the Marriott's Oceana Palms (3200 N Ocean Dr). 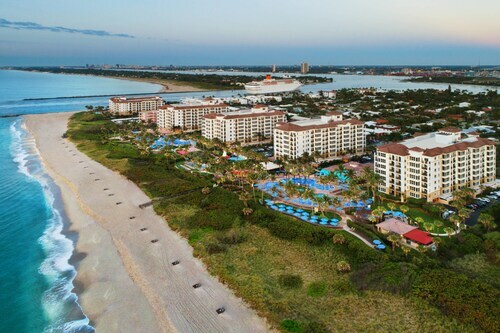 Our top Palm Beach Shores recommendations, they offer a good night's sleep in a convenient location. Where do you fly into for Palm Beach Shores? Hop on the plane and get some rest. Once you've hit the tarmac at Palm Beach International Airport (PBI), you'll have to travel 7 miles (11 kilometers) to reach the main area of Palm Beach Shores. Can I rent a car in Palm Beach Shores? Book a rental car with the help of Travelocity and get to know Palm Beach Shores at your own pace. If your flight lands at Palm Beach International Airport, you can just about pick up a vehicle in the arrivals hall. Dollar Rent A Car and Thrifty Car Rental are worth considering. Make a beeline for Enterprise and you'll be out on the busy streets before you know it. They can be found at 500 Northlake Blvd, a short 3 miles (5 kilometers) from the downtown area. Breathe in the salty air and enjoy watching beautiful seabirds flit overhead at Riviera Municipal Beach. Spending a few hours by the water's edge is always good for your health. Want more close by options? Want to while away an afternoon in a lush, green oasis? Take a trip to Phil Foster Park. And that's not all. Even on a damp day, it's worthwhile taking a stroll through Ocean Reef Park. Put up your umbrella and drink in the fresh earthy smell. Got a little free time? Riviera Beach is a great place to spend a morning. It is just 3 miles (5 kilometers) away. Nestled on the beach, this Palm Beach Shores condo building is 0.5 mi (0.8 km) from Riviera Municipal Beach and 2.6 mi (4.2 km) from Port of Palm Beach. Sailfish Marina and Phil Foster Park are also within 1 mi (2 km). Nestled on the beach, this Palm Beach Shores hotel is 0.3 mi (0.4 km) from Riviera Municipal Beach and 2.5 mi (4 km) from Port of Palm Beach. Sailfish Marina and Phil Foster Park are also within 1 mi (2 km). Nestled on the beach, this Palm Beach Shores condo building is 0.1 mi (0.2 km) from Riviera Municipal Beach and 2.3 mi (3.8 km) from Port of Palm Beach. Sailfish Marina and Phil Foster Park are also within 15 minutes. Situated near the beach, this inn is 0.9 mi (1.4 km) from Sailfish Marina and 2.7 mi (4.4 km) from Port of Palm Beach. Riviera Municipal Beach and Phil Foster Park are also within 1 mi (2 km). Situated by the ocean, this inn is 0.9 mi (1.4 km) from Sailfish Marina and 2.7 mi (4.4 km) from Port of Palm Beach. Riviera Municipal Beach and Phil Foster Park are also within 1 mi (2 km). Situated on the beach, this resort is 0.7 mi (1.1 km) from Riviera Municipal Beach and 2.8 mi (4.5 km) from Port of Palm Beach. Sailfish Marina and Phil Foster Park are also within 1 mi (2 km). Situated in Palm Beach Shores, this resort is 0.4 mi (0.7 km) from Riviera Municipal Beach and 2.6 mi (4.1 km) from Port of Palm Beach. Sailfish Marina and Phil Foster Park are also within 1 mi (2 km). 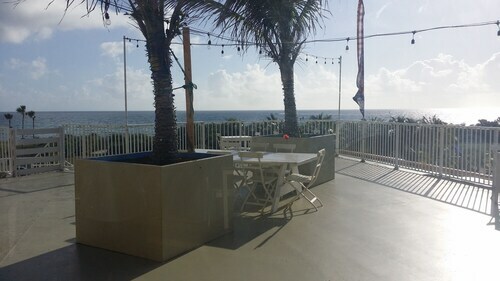 Situated near the beach, this inn is 2.7 mi (4.4 km) from Port of Palm Beach and within 9 mi (15 km) of Rapids Water Park and Clematis Street. CityPlace and Worth Avenue are also within 9 mi (15 km).